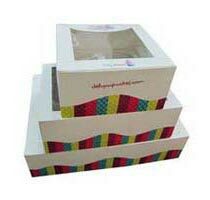 Midway Exports has been involving in Food quality Bakery Boxes for more than 8 years. We have formed an effective operation system integrating the manufacture and sales of paper products including photographing, designing, printing, paper cartons, corrugated boards, paper bags, paper boxes, gift boxes, paper tubes, big decorative boxes etc. We have leveled our package up to a high quality step and the scope of our development has also been enlarged. We exported our products to America, Japan, Europe, Southeast Asia and the Middle East, achieving a good reputation. Our company strictly operates according to the management and quality control system. These values make us stand at the leading position in the competition for the worldwide market. Furthermore, we specialize in producing customized design according to clients' specification. Superior quality, latest design, and excellent service make us enjoy highly reputation at abroad. Any customers' designs and ideas are welcomed, as we can cater to different customers' specific requirements about the printing products. In order to extend overseas market, our company's tenet is "customer first, service uppermost". We are looking forward to working with all clients. We will try our most efforts to supply the best quality and service if we are lucky enough to have the chance to work for you. We hope to establish good cooperation relationship with you, and look forward to development together with you.